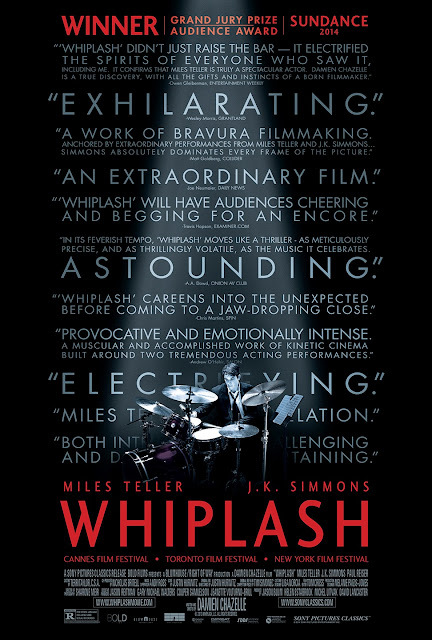 "The road to greatness can take you to the edge", and that is true here in Whiplash. This independent drama film written and directed by Damien Chazelle based on his experiences in the Princeton High School Studio Band. The film follows a young and talented drummer attending a prestigious music academy finds himself under the wing of the most respected professor at the school, one who does not hold back on abuse towards his students. The two form an odd relationship as the student wants to achieve greatness, and the professor pushes him. While attending Princeton High School, writer/director Damien Chazelle was in a "very competitive" jazz band and drew on the experience of "just dread" that he felt in those years. He based the conductor, Terence Fletcher, on his former band instructor (who died in 2003) but "pushed it further" adding in bits of Buddy Rich as well as other notorious band leaders. Originally conceived in the form of an 85-page screenplay, Whiplash came to prominence after being featured in the 2012 Black List that includes the top motion picture screenplays not yet produced. Right of Way Films and Blumhouse Productions, in order to secure financing for the feature, helped Chazelle turn 15 pages of his original screenplay into a short film starring Johnny Simmons in the role of the drummer and J. K. Simmons in the role of the teacher. The 18-minute short film went on to receive much acclaim after screening at the 2013 Sundance Film Festival, which ultimately attracted investors to sign on and produce the complete version of the script. The feature-length film was financed for $3.3 million by Bold Films. In August 2013, Miles Teller signed on to star in the role originated by Johnny Simmons; J. K. Simmons remained attached to his original role. Principal photography began the following month with filming taking place throughout Los Angeles, including the Hotel Barclay, Palace Theater, and the Orpheum Theatre. The film was shot in 19 days, with a schedule of 14 hours of filming per day. The film stars Miles Teller and J. K. Simmons. The two leads gave stellar performances with upmost ferocity. Particularly Simmons who was just an animal. Early on Chazelle gave Simmons direction that "I want you to take it past what you think the normal limit would be", telling him: "I don't want to see a human being on-screen anymore. I want to see a monster, a gargoyle, an animal." And you feel that in every scene that he is in. Even to the point where scared the real musicians in the band and they reactions of terror was captured on film. Whiplash is the greatest film about music ever made. Blending raw performances and musical intensity, blurring the barriers between life and music, body and instrument, drawing equally on the contemporary and the classical. It's marvelously acted, superbly written, and features outstanding music, unforgettable characters and hauntingly beautiful story. It's a cinematic treat for movie lovers! There are no words. As a film critic, I can't really get away with that too often. This feels like a worthy deployment. Film Review: "Dracula Untold" (2014). Film Review: "Gone Girl" (2014).